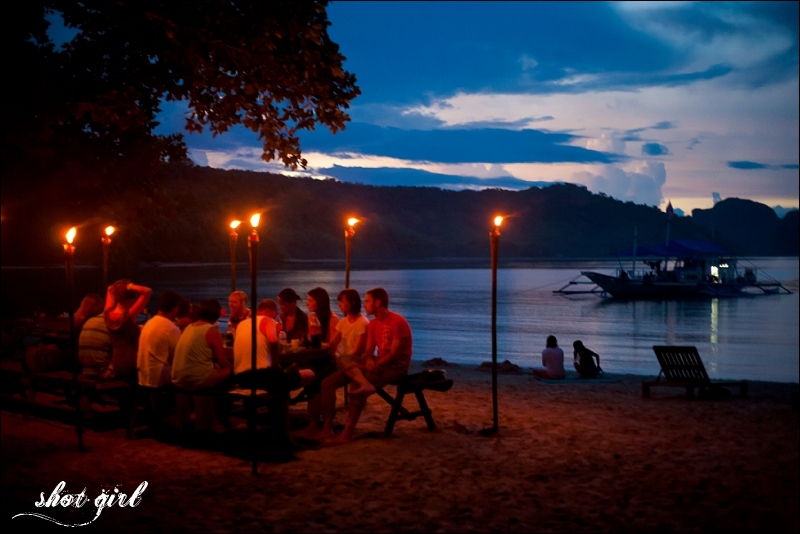 Boracay – Live. Love. Travel. Pretty. Gorgeous. Beautiful. Amazing. Wow. Stunning. These words became part of our daily vocabulary. The Philippines is by far the most beautiful place I have ever visited. Around every corner in the Philippines is breathtaking scenery and the islands just kept on giving, one spectacular view after another. It’s surprise after glorious surprise in a setting more idyllic than you’ve ever dared to dream about. 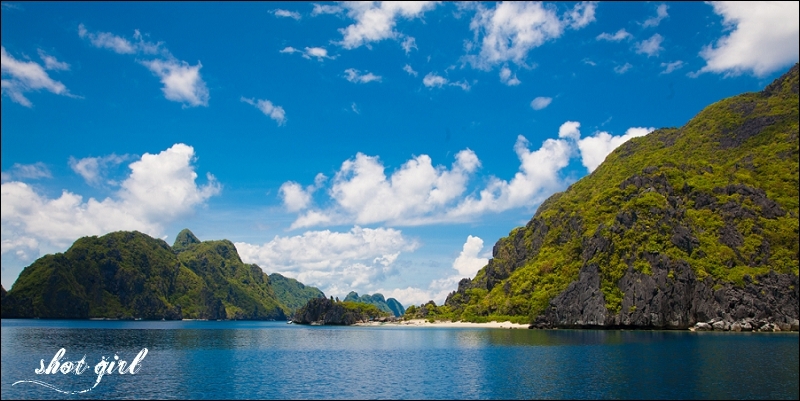 The Philippines comprises of 7,107 islands, some have grown into cities. Some are what tropical dreams are made of. Some are just long enough to lay down on and get a tan. Big. Small. Sandy. Sunny. Relaxing. Exotic. Beautiful. 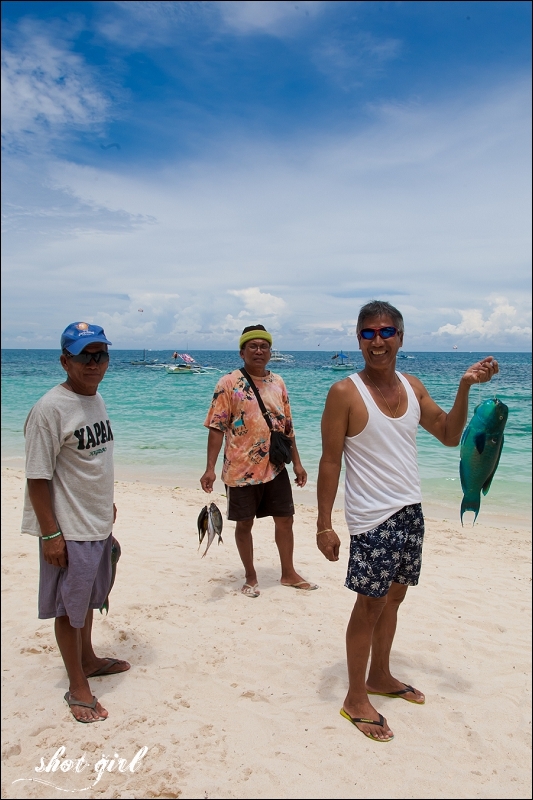 Most tourists who land in the Philippines for R-and-R head straight to Boracay. Europe has Ibiza. The Philippines has Boracay. 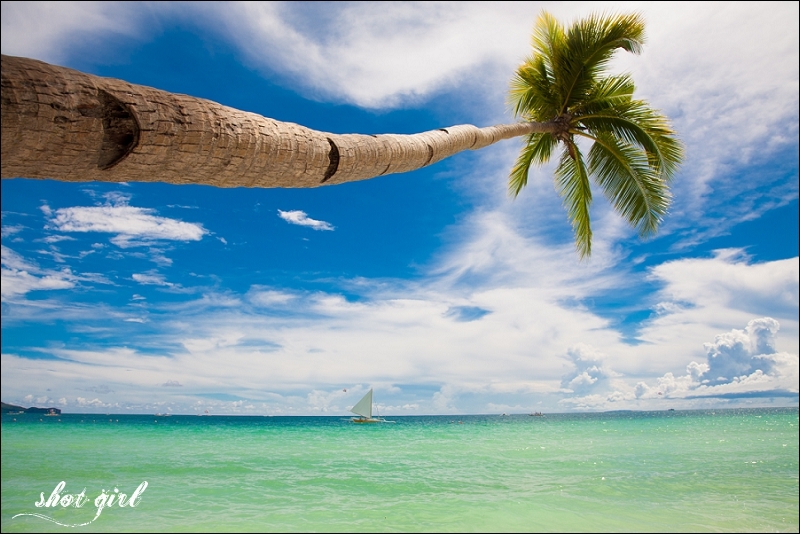 Boracay, is only about 9km long and 1km wide, and it is an intoxicating mix of sun, sea, sand and cocktails. Travel + Leisure magazine just voted Boracay as the “World’s Best Island” beating Bali, Santorini, and the Islands of the Great Barrier Reef. 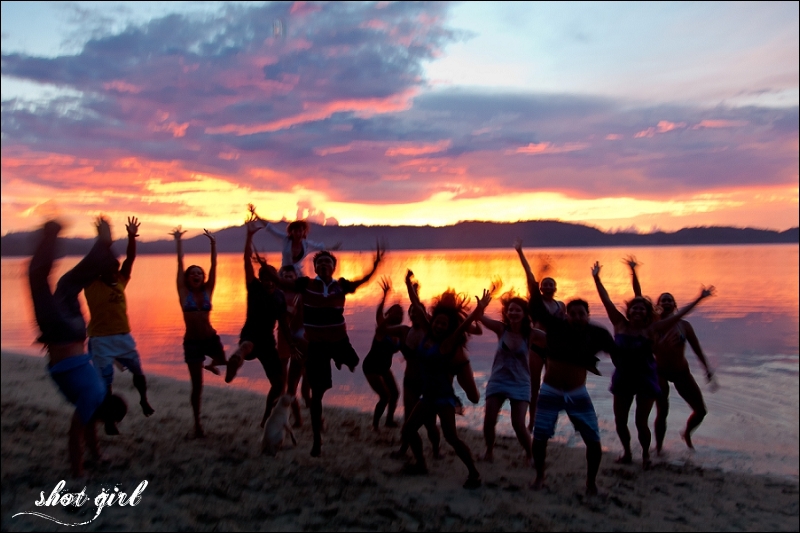 We, however, wanted more than just the typical tourist experience, so after a few days of R-and-R we headed back to Manila and south to Coron where we joined TAO Philippines for an off the beaten track adventure. Welcome to Paradise, if you looked up the meaning of Paradise in the dictionary, it would say a place of extreme beauty or delight. 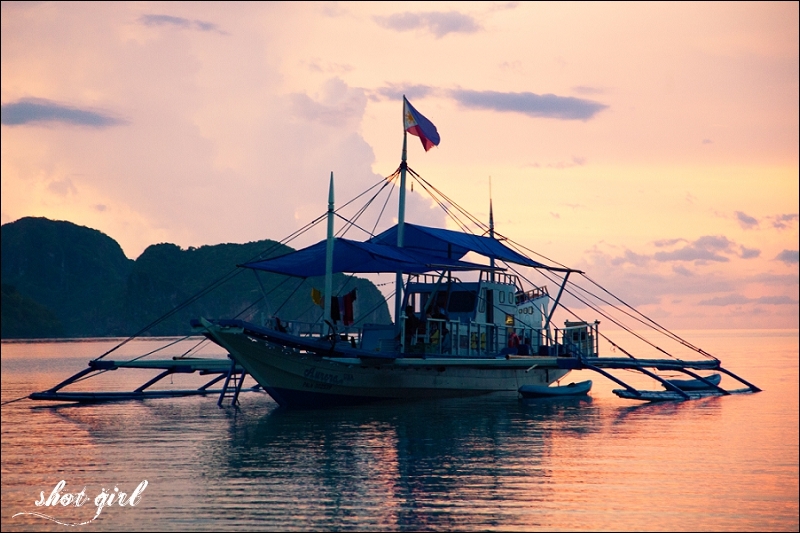 Welcome to Palawan… Welcome to Tao Philippines. 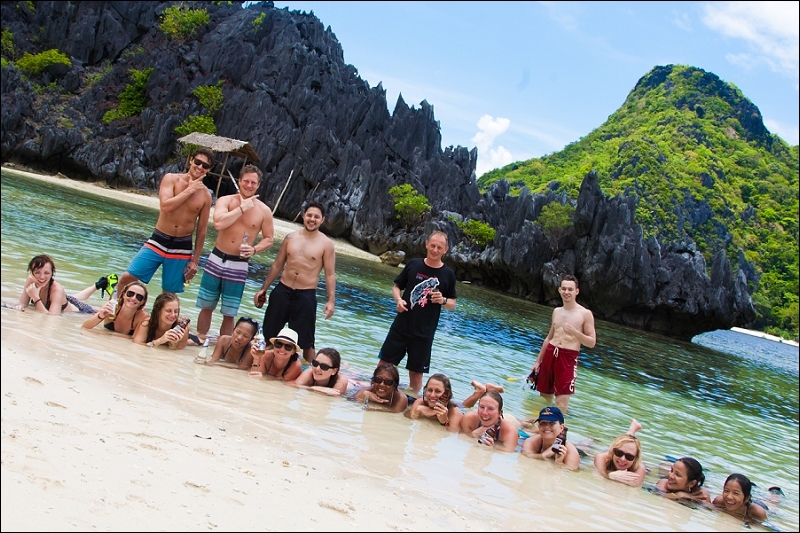 Tao Philippines visits a group of 200 islands on the 150km route between Coron and El Nido in the Palawan region. 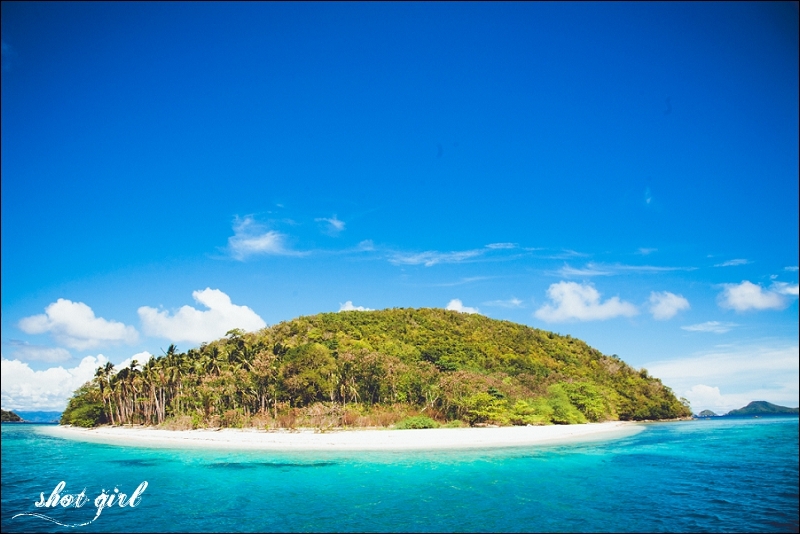 The Linapacan group of islands is an undiscovered tropical paradise with hundreds of white sandy beaches with turquoise blue waters, a wild jungle landscape similar to scenes from Jurassic Park, and unspoiled coral reefs teeming with sea life. This area is possible the remotest location that I have ever travelled to… Where else in the world can you go five full days without seeing any other tourists? As word slowly starts getting out this will probably change and you have to wonder what tourism will do to the Philippines last frontier. Tao’s website clearly states that their “expeditions are not for everyone, we emphasize that this is not a tour. We have no set route or itinerary. We leave port after breakfast on the first day, and arrive before nightfall in the destination port on the last day. 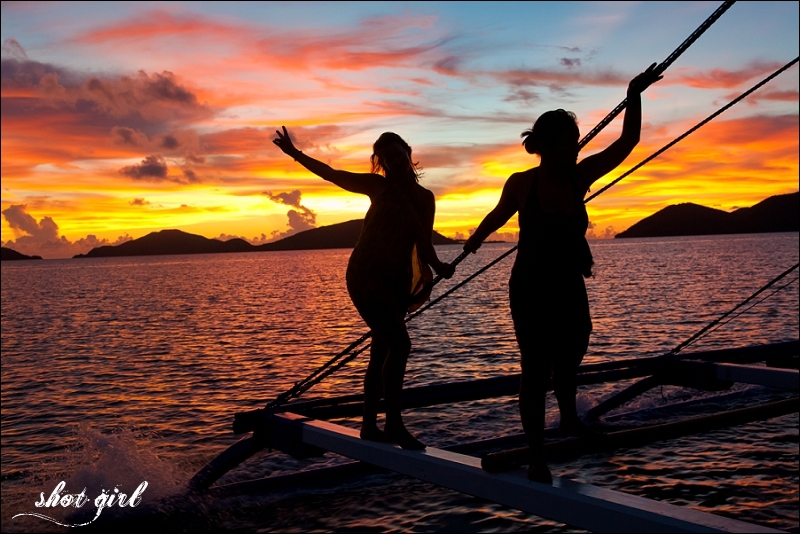 What happens in between is up to you.” There is no set itinerary on Tao Philippines’ expeditions, so each day is a new adventure. There is NO electricity, NO mobile phone signal, NO Internet and you are completely off the tourist beaten track. If you require running water, a regular source of electricity and private accommodation…..then this trip is probably not for you. You have no choice but to take off your watch, turn off your phone, forget your everyday life and hang out on island time. 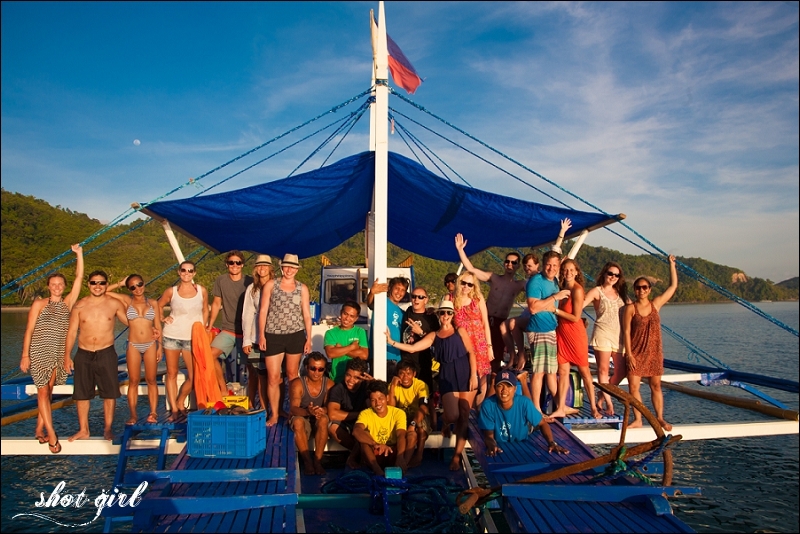 We boarded the Aurora Una, an 82ft blue and white wooden Bangka. 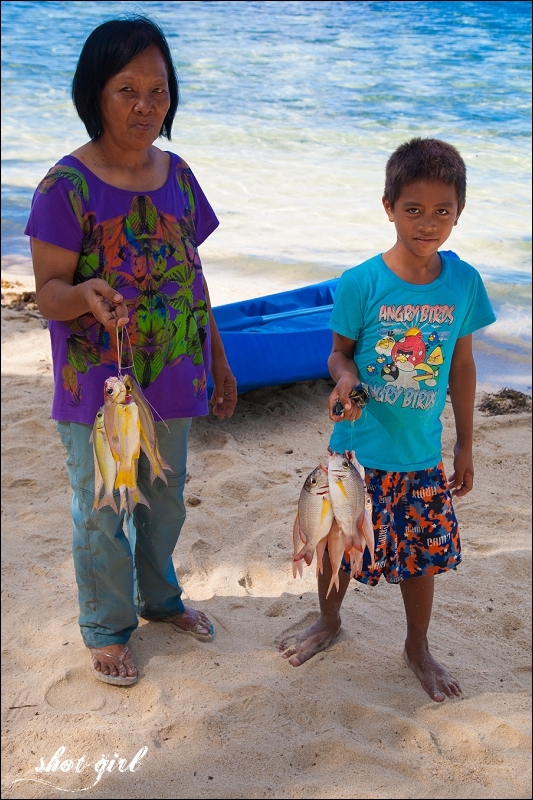 Bangka’s are traditionally used for fishing, however, the Aurora Una, has been adapted for the explorers with a working kitchen and second upper deck. JimBoy was leader of the pack and 17 well travelled souls from across the globe set sail from Coron to El Nido, for 5 glorious days of sun, swimming, fun and great food. By the end of the first night we were like one big family. Along the way we would stop on islands so isolated that tourists rarely see them. 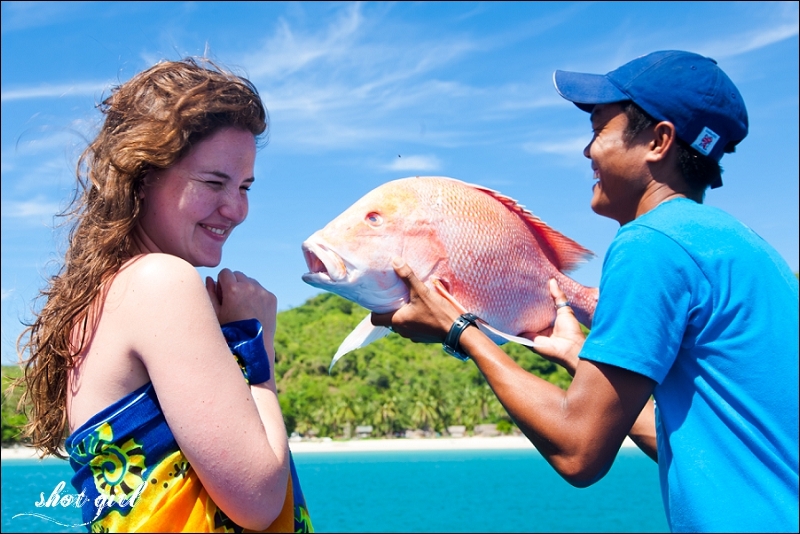 We snorkelled daily at pristine coral reefs, over ship wrecks and we swam through reefs filled with tropical fish, we even saw dolphins and turtles. We also managed to squeeze in fishing from the back of Aurora, kayaking, yoga and we played volleyball and basketball with local villagers. Just as well we did so much exercise as our on board chef was one of the world’s best cooks. Gerry ensured that our stomachs were kept full and happy as we feasted on freshly cooked Pilipino food. Our shelter at night was on deserted islands, where no other tourists get the chance to visit and we stayed in rustic base camps. Evenings were spent chatting over bottles of Tanduay Rum and pineapple juice or drinking bottles of San Miguel. We even did some singing in the most bizarre located karaoke bar imaginable, where we sang along to Jim Boy’s theme song for the trip Oasis’s, Champagne Supernova. 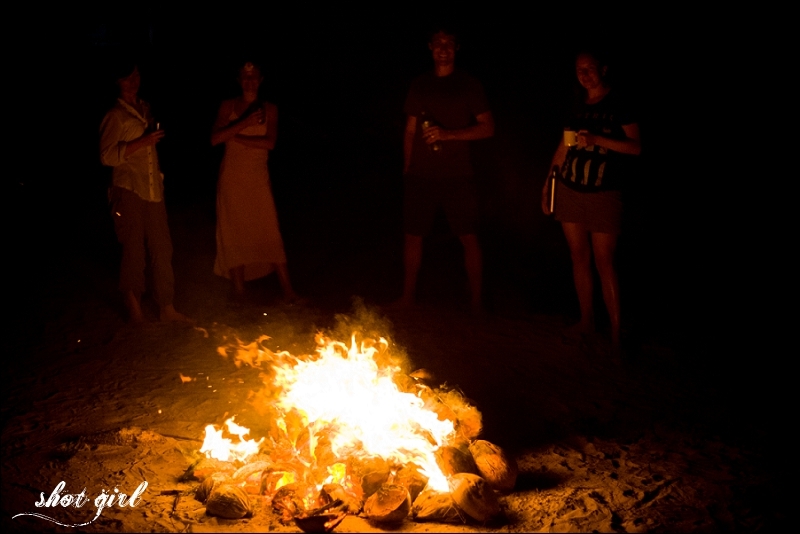 The fire flies came out to play at night and the skies were aglow with constellations. In the morning you would wake up looking at the white sands, coconut palms and crystal clear waters through the window of a bamboo hut. Robinson Crusoe eat your heart out! 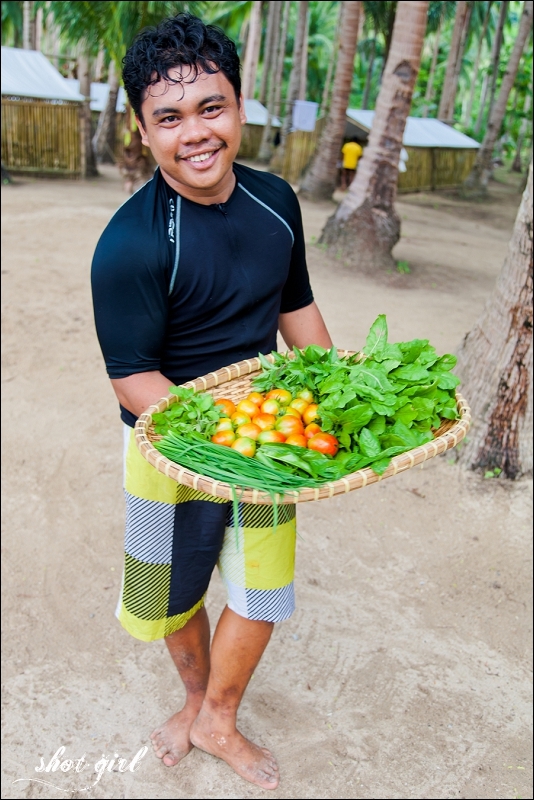 TAO has also been described as “one of the most pioneering cultural eco tourism projects in the Philippines” and they support a small rural economy. They have set up the TAO Social Welfare Project, in return for the hospitality that the islanders have shown them they run a series of projects for children providing day-care centres, teachers, school supplies and feeding programs. As a traveller on a Tao expedition you directly help them to fund these projects as a donation is included in the cost of all their trips. It is hard to put into words the sheer magnitude of getting to travel with the Tao Philippines unless you have lived it for yourself. 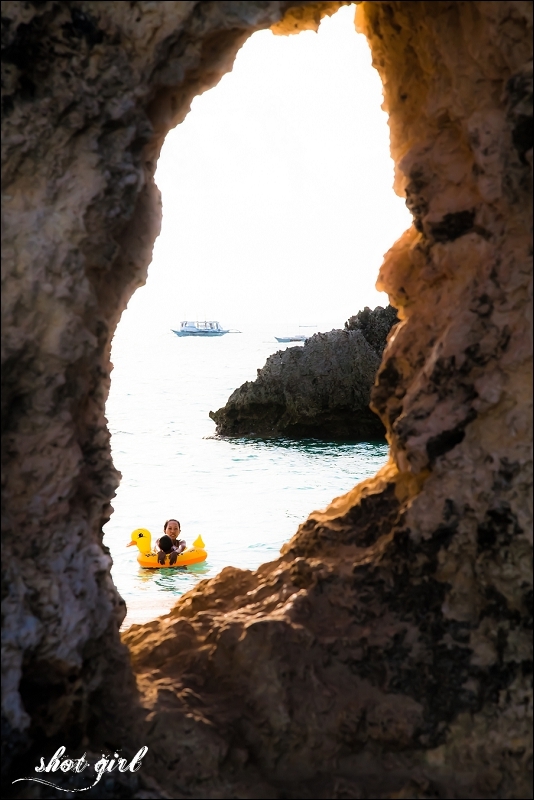 Simply describing the turquoise blue seas, beautiful white sands, the lovely island villages, and the fantastic crew on our boat all seem to be a great injustice. Tao Philippines is like Peter Pan’s Never Never land, where dreams are born, and time is never planned and you will never want to leave. My mind and heart is still on a remote island somewhere between Coron and El Nido. Bring only smiles, take only photos, and leave only footprints..
For those who like their waters blue… their sands white… and their beaches empty.